Part of a line of 80 heavy Angus cows 4-8 years, with Angus calves at foot, from Jugiong, NSW, which made $1550 this week, going to buyers at Dubbo and Blayney, NSW. WIDESPREAD, but mostly light rainfall across parts of the eastern states, and more rain in prospect may have triggered a 15 percent spike in clearance rates on AuctionsPlus this week, with 70pc of lots finding buyers. 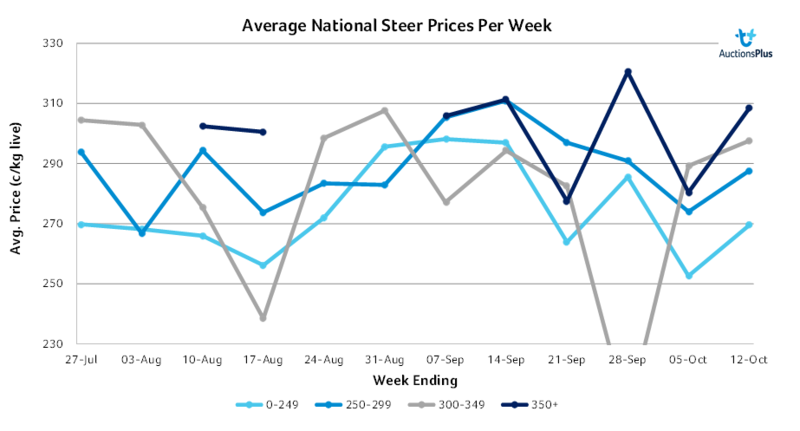 All young steer and heifer weight categories trended higher in price, in some cases by 10-20c/kg. Numbers offered dropped back this week to total 6781 head, down 12pc on the week before, with the weaner and yearling sale accounting for 62pc of the offering. Cow & calf units were in high demand with an 88pc clearance recorded for the 1036 head listed, and an average price of $1264, up $56 on last week. From Everton, VIC, a line of Angus heifers & calves returned the top price of $1810, heading to Berwick, VIC. The heifers are 30-36 months old, with 4-10 week old calves at foot. Another highlight was a line of 80 heavy Angus cows 4-8 years old and calves from Jugiong, NSW, which made $1550. The line was split into two lots and will be heading to buyers in Dubbo and Blayney, NSW. 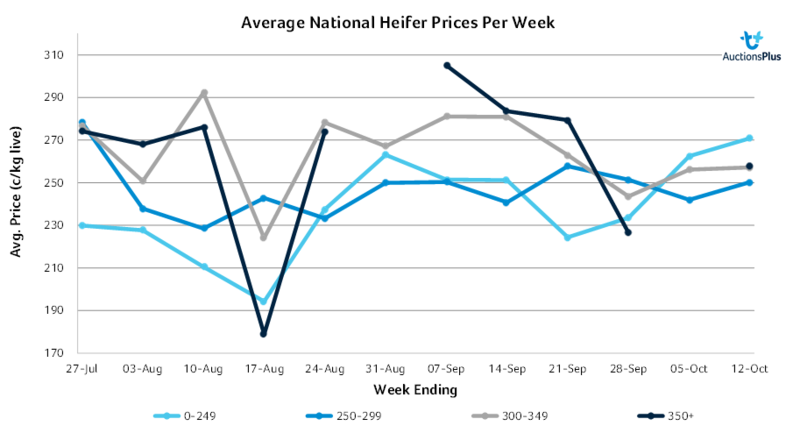 Weaned heifers weighing up to 300kg averaged $648 or 250c/kg this week. Top price of 301c went to a line of Angus weaned heifers 12-14 months old averaging 228kg from Goondiwindi, QLD which found a buyer in Bellata, NSW. Weaned heifers above 300kg were topped by a line of Red Angus from Pipers River, TAS. These heifers were 12-13 months old, averaged 338kg and were bred out of Paringa and Pine Park blood. The heifers found a buyer in Staverton, TAS. In other parts of the country, Angus yearling heifers 16-18 months averaging 433kg from Albany, WA sold for $1115 or 254c, heading to a buyer near Pemberton, WA. Allendale & Yavenvale blood Poll Hereford yearling heifers 12-13 months averaging 318kg from Wantabadgery, NSW sold for $720 or 236c, and are making their way to Cudal, NSW. Angus yearling steers 12-14 months averaging 389kg from Drysdale, VIC sold for $1150 or 295c, heading to Beech Forest, VIC. Murray Grey yearling steers 14-15 months averaging 345kg from Scottsdale, TAS sold for $1090 or 316c, finding a buyer in Barrington, TAS. A line of 120 EU-eligible Shorthorn x Droughtmaster weaned steers 5-10 months averaging 211kg from Barcaldine, QLD sold for $665 or 332c, heading to Taroom, QLD. 119 Brahhman cross backgrounder steers, EU, 18-21 mths at 346 kg, from Emerald, central QLD made 269c/$933. 74 Santa x Droughtmaster weaned steers, 7-10 mths at 290kg from Longreach QLD made $725; while a further 79 lighter siblings 257kg made $650.